"If I'm ever in need of an inspirational boost, I can always count on Athena Calderone to do it. She is the epitome of the #lifegoals. I aspire to host dinner parties with the same finesse and stylish flair and decorate my future house with a similar refined yet cool aesthetic. And in person, Calderone is just about the sweetest, kindest, and brightest woman I've ever had the pleasure of being in the same company with." "There are a lot of design accounts on Instagram, but not many of them approach their posts with such thoughtfulness and storytelling. Jeremiah Brent brings a fresh take on design, fusing old with new, but it's not just an account filled with inspirational room posts (although there is that too). He posts paint palettes to re-create it, style notes, and even blends in his personal style too (he is an impeccable dresser)." "I only recently stumbled upon this account but I have been saving her posts obsessively ever since. If you're truly looking for interiors that are different from sources you're familiar with, then this is your girl. I often find Instagram has homogenized a lot of the content I see—maybe because of an algorithm change—and it has been harder to find original or fresh ideas, so this has been a welcome addition to my feed. Turn your post notifications on for this one." "I know it's slightly biased to choose the Aussie interior designer I worked with on my apartment makeover, but I couldn't compile a list of my favorites without including Tali Roth. The New York–based designer posts a mix of interiors (both hers and others), cool brands to watch, and iconic furniture to know. My favorite was chair week when she dedicated every post to classic chair designs for seven days." "Joyce Downing Pickens of JDP Interiors is hands down one of my favorite interior designers to follow on Instagram. There's something about the way she mixes neutral colors, rich textures, and organic materials that keeps me coming back for more. 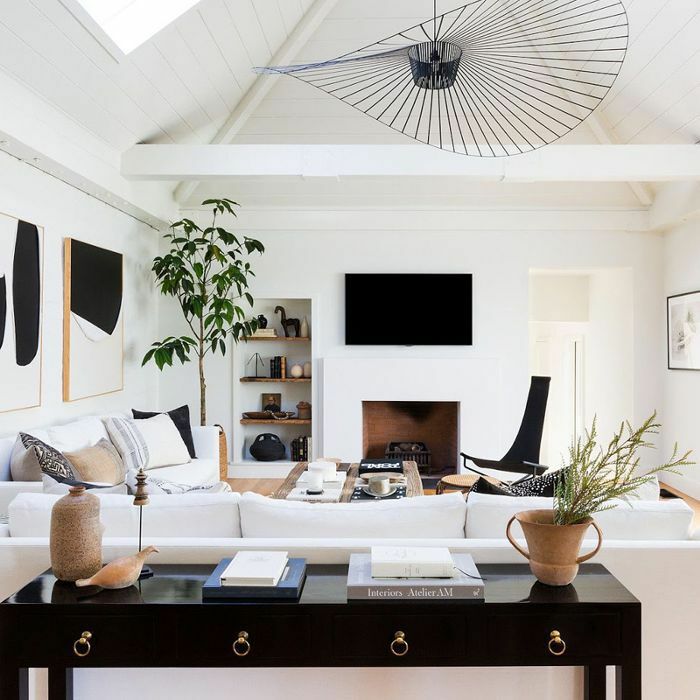 If you also covet interiors with that signature California cool aesthetic, follow JDP Interiors stat." "No one nails laid-back yet elevated design quite like Amber Lewis of Amber Interiors. See the gorgeous kitchen above for proof. (Side note: You must listen to the interior designer related her career path on this episode of our podcast Second Life. I promise you will be thoroughly entertained and inspired.)" "If you follow sought-after stylist Emily Henderson on Instagram, you're probably well acquainted with Brady Tolbert's work. The creative director of Emily Henderson has style in spades—and his Instagram feed is all the proof you need. He has a true talent for striking the perfect balance between modern and traditional in any space." "Jean and her daughter Grace have designed some of my favorite bathrooms and kitchens of all time, and I love when I see a new one pop up in my Instagram feed. The duo does an amazing job at blending the most beautiful elements of a traditional aesthetic with all the right modern flairs." "I'm a huge fan of minimal design, and Scandinavian Homes has created some of the most stunning spaces that have this complex simplicity to them. The designs are understated and low key but also extremely elevated. I also love neutrals, and no one does neutrals better than Scandinavian Homes. Its Instagram is a testament to all of this and a must-follow." "Another one of my favorite Instagram accounts to follow is Studio McGee. Its projects are so classic but still refreshingly modern, and its photography is of the highest quality. My favorite photos tend to be of the spaces with large, beautiful windows that are light, bright, and airy." "I love how Justina Blakeney embraces bright colors and patterns in a way that still feels sophisticated and fresh. Her Instagram adds a welcome dose of maximalist inspiration to my feed (and she's not shy about sharing relatable bits of her personal life, too)." "For a highly curated account filled with high-end furnishings and design inspiration, I look to Arent & Pyke's Instagram. The beautiful photography is always clean and polished, offering aspirational interiors to die for." "The Instagram account of New York design from Ashe + Leandro—this page is brimming with luxe interiors worthy of the glossy pages of Vogue and Architectural Digest. Each image is more stunning than the next and their design style is absolutely timeless with just the right amount of on-trend influences." Looking for more home décor inspiration? Subscribe to our newsletter to have exclusive home tours, trend reports, and shopping guides delivered directly to your inbox daily.